Lady Bird Johnson, the former first lady who championed conservation and worked tenaciously for the political career of her husband, Lyndon B. Johnson, died Wednesday, a family spokeswoman said. She was 94. Johnson, who suffered a stroke in 2002 that affected her ability to speak, returned home late last month after a week at Seton Medical Center, where she'd been admitted for a low-grade fever. She died at her Austin home of natural causes and she was surrounded by family and friends, said spokeswoman Elizabeth Christian. Even after the stroke, Johnson still managed to make occasional public appearances and get outdoors to enjoy her beloved wildflowers. But she was unable to speak more than a few short phrases, and more recently did not speak at all, Anne Wheeler, spokeswoman for the LBJ Library and Museum, said in 2006. She communicated her thoughts and needs by writing, Wheeler said. Johnson was born Claudia Alta Taylor in 1912. A nurse called her "Lady Bird," a nickname she hated, but it stuck, reports CBS News' Harry Smith. The daughter of a Texas businessman, Johnson grew up to be one of the country's most influential environmentalists. After her mother died when she was 5, she found comfort in the beauty of the Texas landscape, reports Smith. "I knew all the trees and brooks and back country roads within walking distance of my home," she once said in an interview with CBS News. She planned to be a newspaper reporter — until she met Lyndon Baines Johnson. He proposed after their first date. Ten weeks later, she said yes, reports Smith. Johnson used part of her inheritance to back her husband's first political campaign for a seat in the House. She spent 34 years in Washington, as the wife of a congressional secretary, U.S. representative, senator, vice president and president. The couple had two daughters, Lynda Bird, born in 1944, and Luci Baines, born in 1947. The couple returned to Texas after the presidency, and Lady Bird Johnson lived for more than 30 years in and near Austin. "She truly was the most influential advisor around Lyndon Johnson," said CBS News chief Washington correspondent Bob Schieffer. "She was a part of the Lyndon Johnson presidency as no other person was." "Lady Bird Johnson was a wonderful first lady and one of the kindest and most caring and compassionate people I've ever met in politics," said Senator Edward M. Kennedy in a statement released today. "She was a great friend to the Kennedy family, in both good times and bad, and we cherished every moment we spent with her. May God bless her and her entire family." "Her beautification programs benefited the entire nation. She translated her love for the land and the environment into a lifetime of achievement," Betty Ford said. Nancy Reagan said that when Lyndon Johnson was called upon to take the oath of office in the face of tragedy after the assassination of John F. Kennedy, "he did so with his courageous wife beside him." She said Lady Bird Johnson served the nation with honor and dignity. "I believe above all else that Lady Bird will always be remembered as a loyal and devoted wife, a loving and caring mother and a proud and nurturing grandmother," Reagan said. "I think we all love seeing those we love loved well, and Austin has loved my mother very well. This community has been so caring," Luci Baines Johnson said in an interview with The Associated Press in December 2001. "People often ask me about walking in her shadow, following in the footsteps of somebody like Lady Bird Johnson," she said. "My mother made her own unique imprint on this land." He said she exemplified "the grace and the elegance and the decency and sincerity that you would hope for in the White House." "Like all Americans, but especially those of us who call Texas home, we loved Lady Bird," Bush said Wednesday. As first lady, she was perhaps best known as the determined environmentalist who wanted roadside billboards and junkyards replaced with trees and wildflowers. She raised hundreds of thousands of dollars to beautify Washington. The $320 million Highway Beautification Bill, passed in 1965, was known as "The Lady Bird Bill," and she made speeches and lobbied Congress to win its passage. "Had it not been for her, I think that the whole subject of the environment might not have been introduced to the public stage in just the way it was and just the time it was. So she figures mightily, I think, in the history of the country if for no other reason than that alone," Harry Middleton, retired director of the LBJ Library and Museum, once said. Lady Bird Johnson once turned down a class valedictorian's medal because of her fear of public speaking, but she joined in every one of her husband's campaigns. She was soft-spoken but rarely lost her composure, despite heckling and grueling campaign schedules. She once appeared for 47 speeches in four days. "How Lady Bird can do all the things she does without ever stubbing her toe, I'll just never know, because I sure stub mine sometimes," her husband once said. 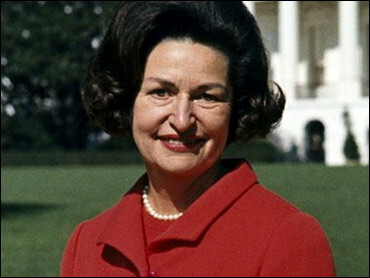 Lady Bird Johnson said her husband "bullied, shoved, pushed and loved me into being more outgoing, more of an achiever. I gave him comfort, tenderness and some judgment — at least I think I did." "She was very hands on. She literally mopped the floor, and she sold radio time," daughter Luci Baines Johnson said of her mother's early days in business. His nomination as vice president on Kennedy's ticket drew her deep into a national campaign. She stumped through 11 Southern states, mostly alone, making speeches at whistle stops in her soft drawl. In his 1965 memoir, "Kennedy," JFK special counsel Theodore Sorensen recalled her "remarkable campaign talents" in the 1960 campaign. In her book "A White House Diary," she recalled seeing Jacqueline Kennedy with her husband's blood still on her dress and leg. "Somehow that was one of the most poignant sights — that immaculate woman, exquisitely dressed, and caked in blood," she wrote. Suddenly, the unpretentious woman from Texas found herself first lady of the United States, splitting time between the White House and the Johnson family's 13-room stone and frame house on the LBJ Ranch, near Johnson City west of Austin. The first lady often would speak her fears and hopes into a tape recorder, and some of the transcripts were included in the 2001 book "Reaching for Glory, Lyndon Johnson's Secret White House Tapes, 1964-1965," edited by historian Michael Beschloss. "How much can they tear us down?" she wondered in 1965 as criticism of the Vietnam War worsened. "And what effect might it have on the way we appear in history?" She quoted her husband as saying: "I can't get out. And I can't finish it with what I have got. And I don't know what the hell to do." After she and her husband left Washington, Lady Bird Johnson worked on "A White House Diary," published in 1970. She also served a six-year term starting in 1971 as a University of Texas regent. She and her daughters remained active in her wildflower advocacy and with the LBJ Library in Austin after the former president's death in 1973. Into her 90s, Lady Bird Johnson made occasional public appearances at the library and at civic and political events, always getting a rousing reception. President Gerald Ford appointed her to the advisory council to the American Revolution Bicentennial Administration, and President Jimmy Carter named her to the President's Commission on White House Fellowships. Her long list of honors and medals include the country's highest civilian award, the Medal of Freedom, bestowed in 1977 by Ford. Lady Bird Johnson received her nickname in infancy from a caretaker nurse who said she was as "pretty as a lady bird." It was the name by which the world would come to know her. She disliked it, but said later, "I made my peace with it." She graduated from Marshall High School at age 15 and prepared for college at St. Mary's Episcopal School for Girls in Dallas. At the University of Texas in Austin she studied journalism and took enough education courses to qualify as a public school teacher. She received a bachelor of arts degree in 1933 and a bachelor of journalism in 1934. The family's privately held broadcasting company — later overseen by Luci Baines Johnson — was sold in March 2003 to Emmis Communications of Indianapolis. Lady Bird Johnson had been a director of the radio company in her later years and even attended most board meetings before her 2002 stroke. "I'm optimistic that the world of native plants will not only survive, but will thrive for environmental and economic reasons, and for reasons of the heart. Beauty in nature nourishes us and brings joy to the human spirit," Lady Bird Johnson wrote.